Luton Town striker Isaac Vassell has agreed a contract extension through to the summer of 2018. The 22-year-old, who was snapped up in July after chief recruitment officer Mick Harford spotted him playing for National League South side Truro City last term, was awarded a one-year deal off the back of his impressive performances in pre-season. I feel I’ve played my part in recent weeks and I’m settled at the club and living in the area after moving up from the south-west. 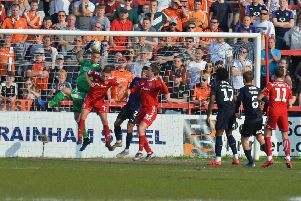 He opened his account for the club in the 2-0 win at Morecambe recently, following it up with the winner during Luton’s 3-2 Checkatrade Trophy victory over Swindon Town, taking his tally to two goals in 24 appearances. Speaking the club’s official website, Jones, who has frequently described Vassell as an ‘animal’ during his post match interviews, said: “We are delighted with the progress Isaac has made. We gave him an opportunity and he’s grabbed it with both hands. “He’s different to what we’ve got and he’s hungry – that’s why we’ve decided to take up the option and give him a new contract. “Over the five months since he’s been here he’s done really well to impress us and grasp his chance. Meanwhile, Vassell added: “I’m absolutely buzzing, but I know I need to keep doing what I’ve been doing and work even harder to improve. “I feel I’ve played my part in recent weeks and I’m settled at the club and living in the area after moving up from the south-west.